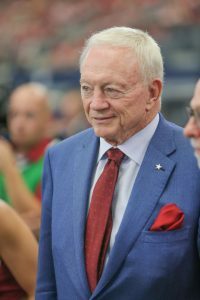 Cowboys owner and general manager Jerry Jones said Sunday that any Dallas player who does not stand for the national anthem and is “disrespectful to the flag” would not play. “Understand? We will not … if we are disrespecting the flag, then we will not play. Period,” Jones said after the Cowboys’ 35-31 loss to the Green Bay Packers in Arlington, Texas. Jones’ comments occurred in response to Vice President Mike Pence abruptly leaving the Sunday game between the Indianapolis Colts and San Francisco after more than 20 49ers knelt during the national anthem. Pence tweeted that he would not dignify any event that disrespects soldiers, the flag or the anthem. Before the Cowboys’ game at Arizona on Sept. 25, Jones and members of his family joined the players, coaches and staff on the field prior to the anthem. They kneeled and locked arms. When the anthem was performed, they stood arm-in-arm with the players. The gesture was in response to President Donald Trump’s comments that NFL owners should fire players who disrespect the flag by not standing during the national anthem. Cowboys defensive ends Damontre Moore and David Irving raised their fists at the end of the anthem before the Sunday game against the Packers, according to the Dallas Morning News. Jones said he was unaware of their actions. Jones is one of seven NFL owners who donated to Trump’s inaugural committee. He spoke with Trump after the Cowboys played the Cardinals. Jones said Trump indicated the NFL should enforce a rule that players must stand for the national anthem. Such a rule is not included in the NFL’s game-operations manual.